Chile’s oldest racecourse is one of the world’s most beautiful. 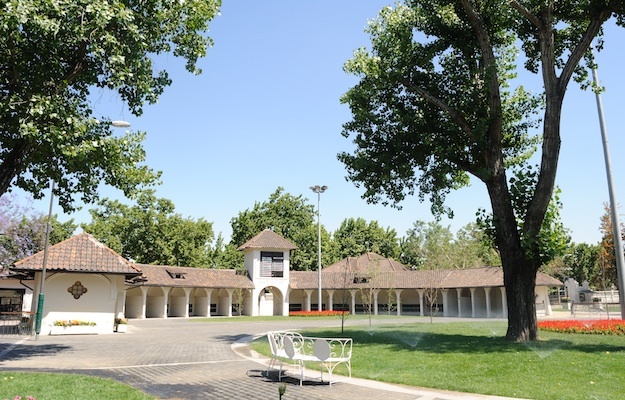 The Club Hipico’s palatial complex is a vast green oasis at the south east of Santiago’s city centre. 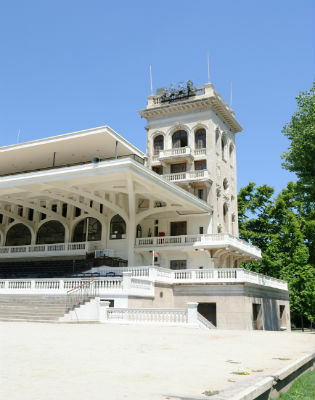 Since its construction almost a 100 years ago, it has ranked as 1 of the architectural highlights of the Thoroughbred world; imaginative, picturesque and almost miraculously preserved. The Club Hipico de Santiago was founded in Y 1869, one of the most transformative periods in the country’s history. The 2nd half of the 19th Century saw far-reaching changes in Chile and, above all, in Santiago, the country’s political and financial hub. Domestic revolutions, foreign wars and new-found mining wealth resulted in profound economic, cultural and architectural change. Inspired by the 19th-Century Enlightenment philosophical movement, Chilean society was fueled by a desire to break with retrospective Hispanic culture, and instead to embrace Europe, particularly France, as a model for modern civilization. Santiago was bent upon becoming a splendid European city, and determined to supplant its ‘colonial drowsiness’ with the vivacity of modern life. To Chileans, the epitome of this was Paris. The colonial city of adobe houses, rarely exceeding 2 stories in height, was transformed as new plazas, parks and promenades were laid out by town planners and foreign architects. To contemporaries, if Santiago was to become a leading modern city to rival the French capital, it was imperative that it possessed its own racecourse – it’s own Longchamp. 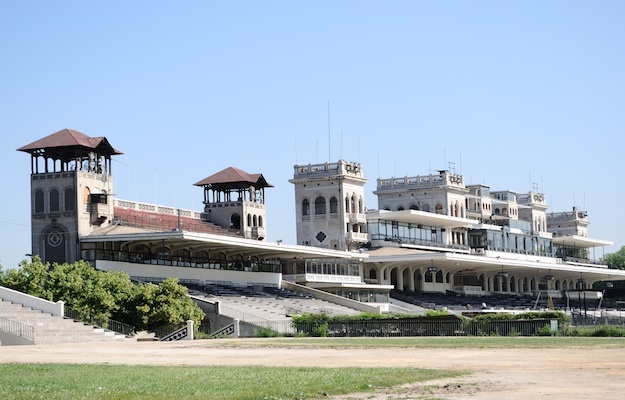 Santiago’s first jockey club, the Sociedad Hipica de Chile, was inaugurated in Y 1866, but it was quickly displaced by the Club Hipico de Santiago. 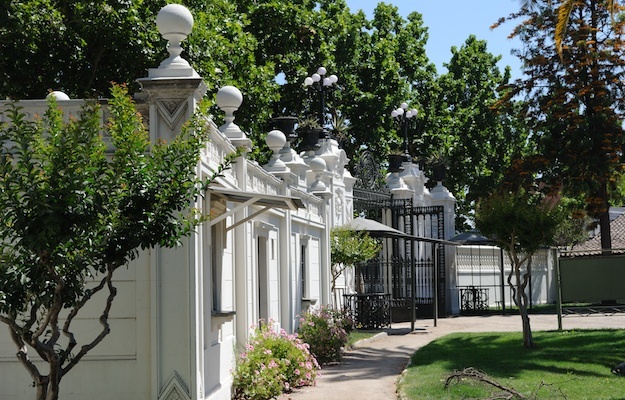 By Y 1870, the Club had laid out a course to designs by French architect Lucien Henault, and it swiftly became a leading venue for Santiago’s elite. The 1st stands were typical of racecourse architecture at the time, iron-framed with two stories of raked seating supported by slender cast iron pillars. Henault’s buildings served the Club for nearly 50 years, but in Y 1918 it embarked on a wholesale remodeling under architect Josué Smith Solar (1867-1938). Smith devised a set-piece ensemble perfectly attuned to Santiago’s infatuation with all things European. In Y 1918, Smith produced a general plan for the facility. Three grandstands, one Members’ Stand and two for the general public were positioned on the track’s west side with views across the Andes, and formal gardens were laid out at the rear. 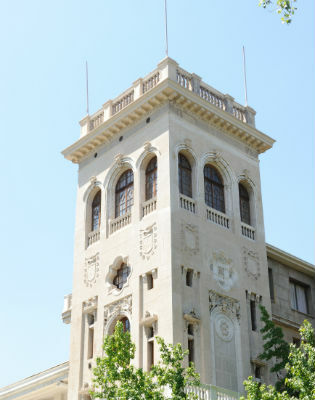 Smith’s designs were a fundamental expression of Santiago culture at the time, a stage for social encounters as much as a venue for racing. It was a place for Santiago’s elite to see and be seen. The Members’ Stand was the chef d’oeuvre of the complex. Its rear elevation – the entrance facade – was a skillful blend of various styles, governed by symmetry and a rhythmic procession of arched and rectangular windows. 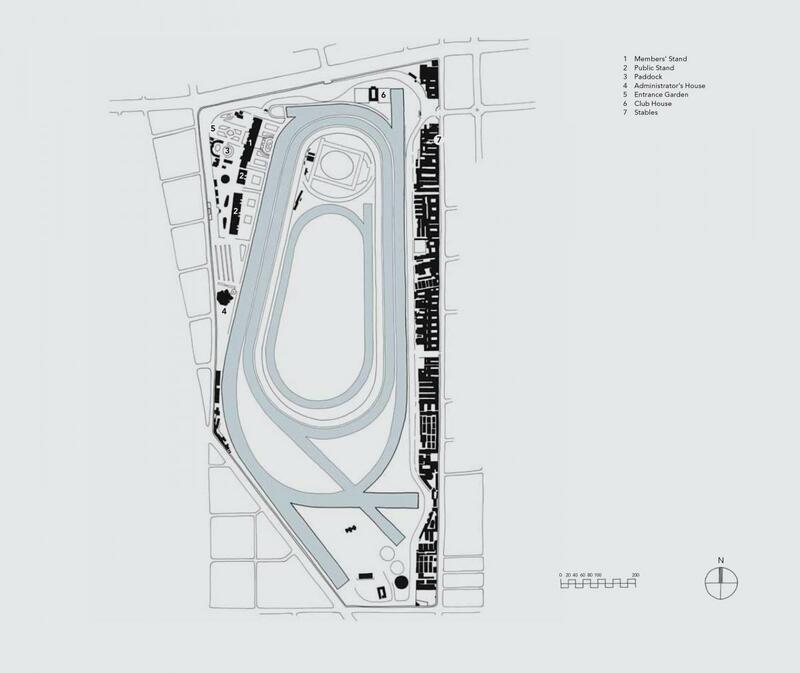 Its basic formula was derived from the stands built at Longchamp in 1904. Longchamp was France’s premiere racing venue, and appeared the height of Parisian chic to Santiago’s aspirant society. Like its Parisian forebear, the length of the Members’ Stand was divided into three sections by four square towers. The track-side elevation featured tiered seating beneath a concrete, cantilevered canopy and an uncovered terrace above. The grandstand was larger than any at Longchamp; it rose 6 stories tall and stretched 121 metres (400 feet) in length. Furthermore, it demonstrated a unique stylistic fluidity. While echoing the Parisian stand’s Beaux-Arts architecture in its massing and symmetry, Smith enriched his building with touches of Florentine palazzo, Renaissance chateau and medieval Italy. Its 4 stair towers were adorned with Renaissance-inspired heraldic reliefs, sculpted winged horses, and medieval barbed quatrefoil windows. From over sized keystones to balustraded balconies and Grecian urns, few surfaces of the Members’ Stand were left unornamented. This eclecticism would characterize the whole of the racecourse’s physical fabric. The club’s emblem – the initials CHS intertwined in a florid, classicist design – was emblazoned across the grandstand within its wrought iron balconies, stamped in stucco on its consoles, and fashioned in miniature on its window handles. The emblem was repeated on the extravagant iron gates at the main entrance to the racecourse. Either side of the gates, Smith designed a curving white stucco wall. This too was bedecked with an exuberance of classical detail: orbs, urns, cornucopias, garlands and grotesques. Its rococo profusion was the prelude to a formal sunken garden in front of the Members’ Stand. The garden was a French-inspired parterre with a fountain at its centre and a grandiose Grecian Odeon, or musicians’ pavilion, to its north. To the south of the grandstand stood two further stands. Lower and smaller than the members’ pavilion, these two public stands were rusticated cement structures with raked seating on two levels overlooking the track. Although much simpler than the Members’ Stand, they were still redolent with historic eclecticism. This time, Smith was inspired by the Renaissance architecture of Tuscany. The focal points of the stands were tall stair-towers crowned by peaked roofs upon open timber frames, and poly-chromatic stonework in bands and roundels. Moving from Italy to Iberia, the paddock to the rear of the grandstands was given a Spanish Mission Revival flavor. The stalls at the western perimeter of the oval saddling arena bore the round-arched openings, low-pitched roofs, red tiles and white stucco walls, which characterized the style. Adjacent office and jockey buildings continued the theme. Here, round arched windows, heavy wooden doors, overhanging eaves, and intricately carved wooden trims were fused with flourishes of Baroque swags and cornucopias applied to their stucco surfaces. Smith’s complex was completed in Y 1927 with a club house at the northeast turn of the track. This was not a clubhouse in the convention of American racecourses. It was not designed as another stand; indeed it had no view over the course at all. Instead, it was a place for Club Hipico members to socialize, dine and relax. It was an English neo-Tudor chalet replete with tennis courts and a swimming pool. Faux half-timbering characterized the building, both internally and on the ends of its projecting gable roofs. At the rear, an Italianate arbour surrounded the pool, sheltered by vines and upheld by texturized stucco piers. This jamboree of architectural genres may easily have resulted in an overpowering confusion of styles. Yet Smith’s bold combination yielded a unique composition that perfectly expressed the mores of his age. Academic classicism, baroque exuberance and rustic Mission Revival worked in parallel, united by symmetry, grandeur, inventiveness and quality. What is more, almost all Smith’s original concept has been meticulously preserved and maintained by succeeding generations. To visit the Club Hipico is almost to step back in time to the early decades of the 20th Century, to the golden era of thoroughbred horse racing in South America. F. Letamendi Urcelay, ‘La Arquitectura del Club Hipico de Santiago y la Contribucion de Josue Smith Solar’, unpublished research, 2000 n. pag. Condensed from Racecourse Architecture, by Paul Roberts and Isabelle Taylor.